A recent PwC survey noted that 45 percent of business and IT executives across 51 countries identified growing revenue via digital transformation as a top priority1. Success in this fast-paced digital landscape requires businesses to transform their IT infrastructures to achieve new levels of flexibility and responsiveness. At the same time, business leaders must find a balance between funding core aspects of the business while investing in new business and technology innovations needed to compete in today’s dynamic environment. 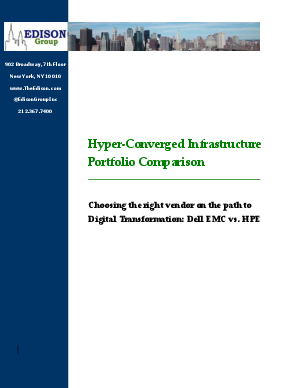 Hyper-Converged Infrastructure (HCI) systems bundle multiple technology components together into single systems, enabling IT departments to spend less time managing separate data center components and more time proactively delivering value to the business. In this white paper, we compare the portfolio offerings of Dell EMC and HPE, and highlight significant benefits to be realized when partnering with the HCI market leader: Dell EMC. Dell EMC Powered by Intel® Xeon® Platinum processor provides a tightly integrated software ecosystem and the flexibility to run multiple workload types, providing solutions to a broader customer base than HPE.